Buy New larger output HPYL-140 sunflower seed oil press machine - Shandong Leader Machinery Co.,ltd. 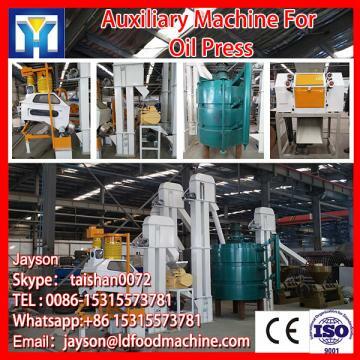 This sunflower oil press is with the higher quality ,which is improved product based on many yearsâs experience of our factory and feed-backed information from the users. 1. High oil yield (the rate of the outlet oil >93%),residual oil of the Cake is less,crude oil is clearer. This sunflower oil press is suitable for Physical squeezing all kinds of vegetable oil material ,such as soybean, cottonseed ,peanut, rapeseed,sunflower, teaseed , coconut dry , gendarmerie seed and palm kernel etc. For the whole New larger output HPYL-140 sunflower seed oil press machine,warranty is 12 months,within 12 months,if have equipment quality problems,we will provide accessories freely. After the expiration of the warranty period,if have spare parts problem,we only receive the cost of required replacement parts.We commit we will provide free technical support of equipment all whole life. Our company has engaged in producing and exporting New larger output HPYL-140 sunflower seed oil press machine for many years, and until now, our machine has exported to overseas market, such as Brazil, India, Indonesia, Russia, Thailand and so on, and get the foreign customers' unanimous praise. We believe that you purchase Shandong Leader Machinery Co.,ltd. New larger output HPYL-140 sunflower seed oil press machine is your best and sensible choice.